You might think Daft Punk was playing at my house last night, but it was really just Girl Talk at the Gargoyle. Mash-up extradinare Gregg Gillis, armed with his trusty Dell laptop swathed in cling wrap, packed the house and got the sweat flying all in short order. And it was all fun and games until someone got tased. 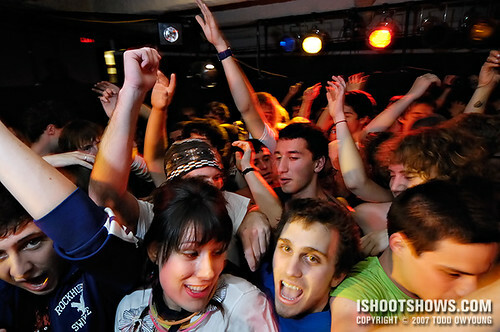 At the Gargoyle, there's no photo pit, so I packed in early with all the die-hard fans ready to sacrifice their bodies in the hopes of rubbing up against Girl Talk's bearded self (or at least be crushed against the cafeteria table that supported his setup). Between a sold out venue, rowdy drunks clamoring to get on stage, and people generally in the mood to cut a rug on a Friday night, the Gargoyle was all riot from the opening beats until the plug was pulled. Just as raucously as the party started, it all came to and end as one unruly attendee was tasered after resisting arrest. For those following the story, Pitchfork has posted a piece on the event, including some words by Gillis himself on the incident. All plans go out the window when the shooting situation is essentially one big mosh pit of sweating, mildly intoxicated youths and you're in the middle of it. The lighting for the venue, as always, was dim and dirty. Going into this set, I knew that, even at full power, the venue's lights weren't going to throw enough light on the party to capture what I wanted. Enter the Nikon SB-800 speedlight. I used the flash off-camera with a sync-cord held in my left hand while I handled the D2x with my right, bouncing off the ceiling. This technique allowed me to elevate the flash above the crowd for cleaner bounces that cleared most heads and upraised hands, making the most out of the white ceiling. The flash was set to TTL at 1 and 2/3 negative EV compensation, shooting at ISO 1600, f/4, and between 1/25 and 1/50 second. For this show, I used the Tokina 12-24mm f/4 exclusively and relied on the ultra wide angle lens to photograph the close and clamorous quarters of the event. While this lens is normally far too slow to use for indoor concert photography, the pairing with the flash allowed the unique range of this lens to shine. Amazing how you managed to get shots in that crowd! Tor, it was pretty insane and these shots come from just a few minutes of being in the middle of things. I managed to scramble on stage — along with what seemed like about half the venue — and made some quick snaps of the chaos before jetting. Luckily the D2x and all the rest of my kit escaped unscathed, though it could have easily ended another way, what with all the sweaty bodies and elbows in the mess. Really nice set of pics. Glad to see your gear came out unscathed! I had some close calls when I saw him back in September. Hey Jason, thanks! Between holding the camera in one hand and the flash in the other, staying upright in the crowd felt like treading water without any arms. I’m sure you can empathize. 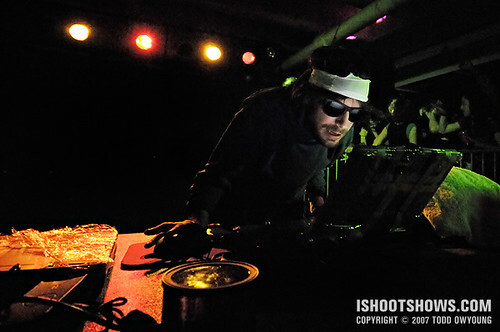 The only other show I’ve shot that was like this was the Blood Brothers show at the same venue. Crazy. awesome pictures as always, i love that brandon’s cashews made it into the first one. Wow, great work! Did you use the same bounce technique with this shot, too? I love how you were able to pick up the ambient light in that one. 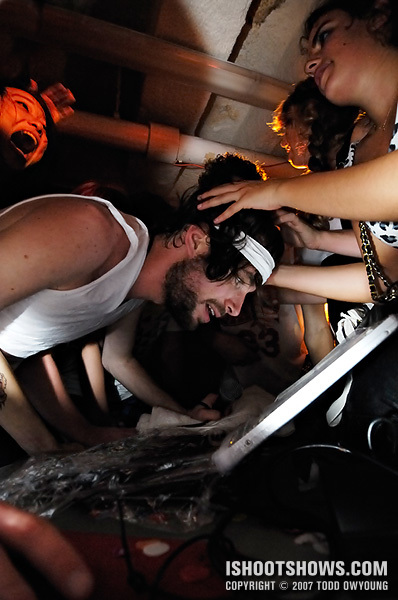 By the way, I found you via Pitchfork’s article on the, uh, taser incident at this show. I’m definitely bookmarking you! I wasn’t a big fan of that night, but your photos are great! Billy: Thanks for the feedback. Yes, the nut can is representing. This was a pretty much as insane a shoot as they come, so I’m glad a few of these snaps worked out. Irma: Hey, thanks for the comment. On that shot you mentioned, the “calm before the storm,” I just shot with the ambient light — no bouncing on that. Gregg’s laptop screen was actually pretty bright, even at f/4 with the lens I was using. Thanks for the bookmark. I’ve had a ton of traffic coming from Pitchfork this morning. I guess nothing draws a crowd like a controversial tasing. Sarah: Thanks, I’m glad you like the images. WOW…great shots Todd. You make it look so easy when in fact this seems to have been a really tough gig to shoot! I can’t even begin to understand how difficult it must have been to hold the speedlight in one hand and the rather heavy D2XS in the other one. Hey Carsten, thanks for the feedback. 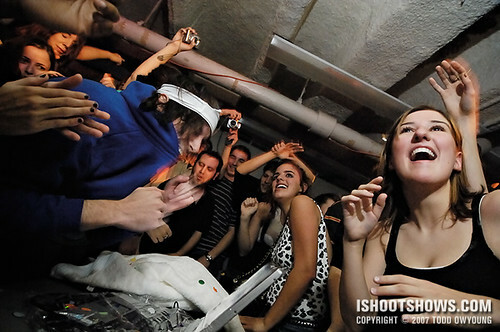 It was probably one of the roughest shows I’ve shot. Usually a “tough” show due entirely to the lighting. 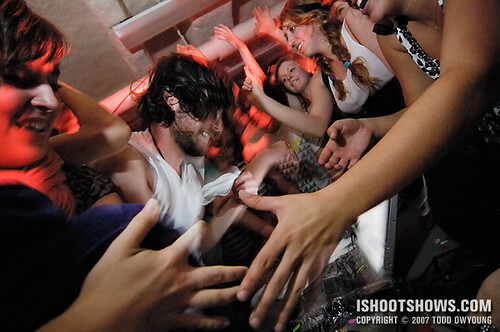 In the case of Girl Talk, it was in part due to lighting, but the physical aspect was the must difficult. For all but the second shot, these are all snaps “from the hip,” utilizing the wide field of view at 12mm and shooting blind. I’m used to the weight of the D2x now, but it was certainly a balancing act just trying to stay up right for this one. At Forecastle Fest 2007 in Louisville Kentucky. Thanks for the video. Looks like a good time without quite as much chaos as went down with this incident.